Harrogate Pythons' Rich Paterson on the charge during Saturday's mauling of Skipton. An emphatic 64-5 triumph moved Dan Bird's team a step closer to promotion, and they now need just one more win from their remaining three fixtures to secure their place in Yorkshire Two for 2019/20. 'Gate did however make the worst possible start to proceedings, finding themselves 5-0 down inside 60 seconds. An innocuous high kick by the visiting full-back was not collected by the home defence and the ball bounced wickedly back into the Skipton man's hands allowing him to open the away account with the softest of tries. Putting that early setback behind them, the hosts responded well and were level within 10 minutes. Ned Rutty and Rich Paterson were both tackled short of the line, though Steve Lennox was first to the breakdown second time around to pick up and drive over the line. With the Pythons visibly growing in confidence, prop Steve Smith then broke the Skipton line, Joe Bentham took the ball on and found Jed Carr, who dummied his way under the posts. Carr added the conversion for a 12-5 lead in the 17th minute. A third home touchdown arrived before the interval when quick ball from Ram Ismail allowed 'Gate to spread the play wide. Bentham raced away for the corner and just before he was tacked he threw a pass behind his back to the looping Matt Halpin, who dashed away to finish under the sticks. Carr’s conversion left the half-time score at 19-5 in favour of the Pythons. Coach Bird made several tactical substitutions at the break and the fresh legs had an immediate impact. A Bentham kick through was retrieved by Matt Leach, who broke the gain-line, allowing the hosts to go wide to Rutty who scored by the posts. Carr added the extras for 26-5. Skipton were then pushed off their own ball at a scrum, Hugh Tatlow picked up and flicked the ball inside for Ollie Wheatley to score by the posts, Tom Breakwell converting. The visitors responded by making good ground towards the 'Gate line, though Rutty intercepted an attempted pass out to the wing and raced nearly the length of the pitch for another touchdown that was converted by Breakwell for a 40-5 advantage on the hour-mark. Another scrum won by the Pythons against the head saw Breakwell attack the blind side and put Paterson away. He drew his man and sent Rutty clear for his hat-trick try, again converted by Breakwell. More good scrummaging then allowed Liam Kernoghan to put Jed Wolfram into a gap and the latter pinned back his ears to score out wide, making it 52-5 in the 65th minute. Next, a lovely break and kick ahead by Wheatley forced Skipton to concede a line-out where the ball was taken by Kris Starkey and Ismail drove to the line before Dan Shortman picked up and burrowed over. The game's final try arrived when a clearance kick was kept in play by Breakwell, who linked with Wolfram and the ball passed through several pair of hands before Jon Pickard burst through a gap to score under the posts. 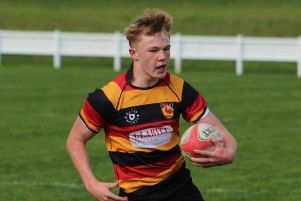 Breakwell booted over the additional two points to round off the scoring at 64-5 ahead of this weekend's visit to fourth-placed Leeds Corinthians.